i think it should just be bats that do this rather than just add a new mob for it. That's a good point, but I don't think Mojang is going to do anything with bats. It's been suggested enough times. That is because somehow I got into my head that the pigeons that delivered messages, were called passenger pigeons, when it is actually an extinct kind of bird. I'll fix the op. Yes you could do that. If a pigeon with a message flies over your base and doesn't stop, then feel free to shoot it and get whatever was being sent! But you would have to get a lucky shot. actually, it hasn't, i can only think of one suggestion for taming bats, all the others were for drops of some kind. Yes, you're right! I did some googling around and the birds were indeed called "passenger pigeons." But they are actually a type of dove. They went extinct somewhere between 1900 and 1930. There's some talk that they were used in the olden days to deliver messages, but that may be an urban legend. It would be able to fly (follow), or stand (sit), until you are ready. 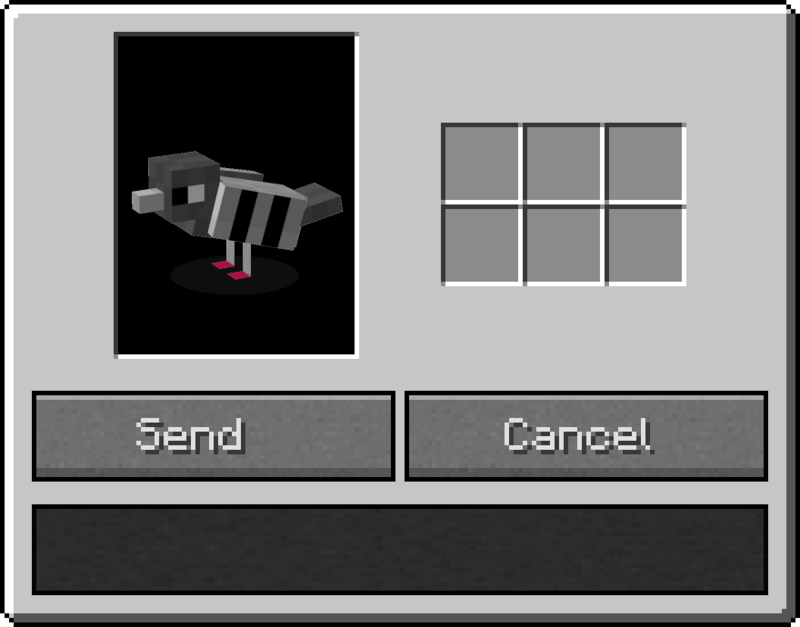 When you want to send something, right click the tame pigeon, and this GUI will come up. When you send a pigeon to a user, it will teleport to their bed, with a delay depending on distance between the 2 objects, the blocks:minutes ratio would be about 500:1. If the distance is shorter than 500 blocks, It will just fly the distance. 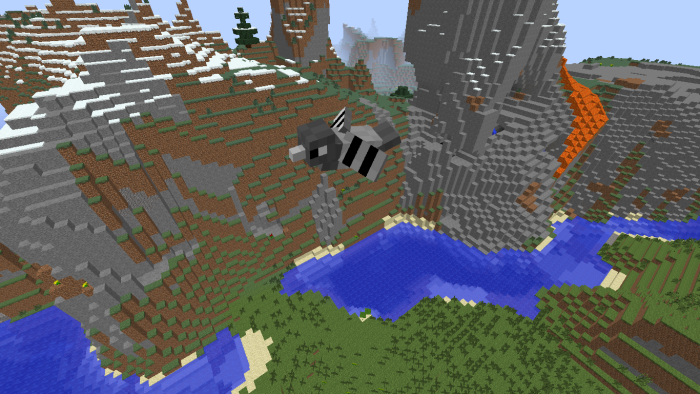 This is so that on small map PVP servers, and UHC's you can have fun shooting down enemy pigeons. Once it arrives, it will be sitting on the bed. Once the player has found it, and taken the items, it becomes that players pigeon. Only the owners of pigeons can use there inventories. Um... It doesn't load chunks anymore. Also, never actually quote the op, unless it is very short. This is a great idea. Support! Maybe have the ability to set up pigeon coops for use in single player. Sounds nice! I would love to have Pigeons deliver my items! That what i talk about. How about the pigeon 'dissapears' when it leaves the field of sight (depending on render distance) of the player that sent it? I don't think that'd require minecraft to load any chunks that aren't loaded already. Also, how would the pigeon end up on the bed of a player that lives on Y: 10 (like me). I really like the idea, but I don't own a single house that has an entrance a small bird could possibly enter. why do you not make entrance for small bird to enter? Why Would You Want To Kill It? Naturally people would say "Oh, this is a fantastic idea"
Umm... This suggestion needs to be the next "Cubic Chunks." 1.D you know how to code? And why would it's sounds be hard? 2.Um... Are pigs, and chickens that common in real life? I don't think so. 3. It only loads small amounts of chunks. 4. It would follow you like a wolf, and only fly when it moves. It goes to a players bed, not the player it's self. 5. Did you read how it could be useful on singleplayer? Why is minecraft adding map maker changes, when not many people play maps? 6. Yes they could. Because of these last 2 questions, I doubt you read much of the OP. On the topic of the pigeon flying to other players: How about the pigeon 'dissapears' when it leaves the field of sight (depending on render distance) of the player that sent it? I don't think that'd require minecraft to load any chunks that aren't loaded already. Also, how would the pigeon end up on the bed of a player that lives on Y: 10 (like me). I really like the idea, but I don't own a single house that has an entrance a small bird could possibly enter. I did not think of the part that pigeons couldn't get to beds, but I have a workaround. I don't see how the pigeon teleporting is bad. Not really. Their animation isn't much more complex than any other mob, just the flapping of wings, which can be modified from the Bat. They can also use the Bat's idle and perch AI (although they wouldn't hang upside down) and the follow AI from Wolves to follow their master when not on a job or told to stay in one place. Just because they are common in the real world does not mean they need to be common here. Realism is not a necessary reason to include or modify anything. The loading chunks is already solved. So not an issue. And if it WAS an issue, that is a simple NBT tag. If OnDelivery = 1 then they load chunks, and if not then they don't. Easy. It says in the OP that they go to the bed of a player. I do think this needs some changing as not everyone will have a bed and someone might have several which could cause some issues. But this has also been discussed. I'd say if the player is in the Overworld and in direct sunlight, the player will appear and make a special sound (perhaps a special cooing noise) to alert the player they have an item. If the player is logged out, it will appear when they log in. Also has uses in SMP, MUSHROOMSOCK addressed that in the OP and in his response to you. So is breaking anything a player owns and taking it, or killing a player. What is the difference? If it is a no griefing server, an anti griefing plugin will protect them. I'm still working on what happens If you don't have a bed, but I have done an addition to the OP to fix an issue. Also you can only have 1 bed. True that you can have one active bed but that bed changes whenever you lie in it. So if you had multiple beds on a server and had slept in one bed the Pigeon would go to that bed, but you could be a long ways away from that bed. Also, what if a pigeon goes to your current bed and then you change beds by using a new one? Would it go to the new one instead? If the pigeon is no longer at your bed then it will continue going to your bed. I was going to support this idea, but then I kept thinking how this would actually be used in an everyday situation. From what I see here, it's primary use is multiplayer, when you and your friend are far apart. Then your friend would need a specific item, which you can send with the pigeon to his bed so you don't have to walk back to his house. Sounds easy enough, but the problem is you can only do such a thing once. If your friend got his items but requires something more, he can't send your pigeon back to you because you're nowhere near your bed. Perhaps the pigeon would just return to his original owner instead of switching owners all the time? You just send more pigeons. I forgot to directly mention that they spawn, and despawn, so you can send more than just one of them. If that doesn't relate to what you are saying, I don't get what your point is. Added a poll about how pigeons should spawn. Added a banner, and a title. Added detail on pigeon spawning. Shortened the amount of blocks a tame pigeon can fly when delivering a message.